The jostle of potholes notwithstanding, motorists might find nothing unbalanced about Chicago’s public streets. But the Active Transportation Alliance points out while nearly a quarter of the city is in the public right-of-way, cars dominate practically all of it. Citing the city’s Make Way for People initiative, which turns over underused street space to pedestrians, the group released 20 proposals Wednesday, calling on City Hall to create car-free spaces from Wrigley Field to Hyde Park. Their full list is available here. It includes a protected bike lane and landscaped seating area on Dearborn and/or Clark Streets, from River North to the South Loop; a pedestrian plaza on 18th Street in Pilsen, created by a dead-end at Carpenter, Miller and/or Morgan Streets; closing Milwaukee Avenue through the square of Logan Square; and closing portions of the vibrant retail corridor on 26th Street in Little Village to vehicle traffic. “Our hope is to jump-start conversations that lead to further study and the creation of car-free spaces,” writes the Active Transportation Alliance. The civic group said the list is inspired partly by places like Navy Pier, Times Square in New York City, and existing pedestrian plazas like Kempf Plaza in Lincoln Square. A spokesman for Chicago’s Department of Transportation told the Tribune that the agency “agrees with the concept,” but wouldn’t weigh in on any of the Active Transportation Alliance’s specific suggestions just yet. The Make Way for People initiative's so-called “complete streets” have gained traction among urban planners for their inclusion of pedestrians, bicyclists, and green space within the standard two- and four-lane roads that cater almost exclusively to cars. 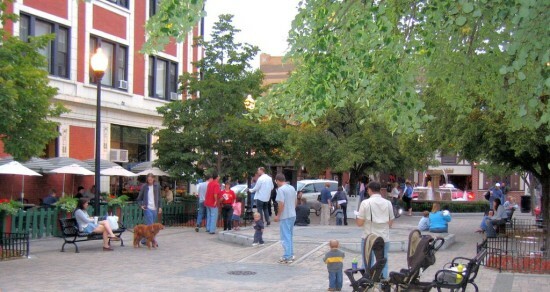 New York has overhauled dozens of public streets and plazas in recent years. Chicago designers, including North Center-based Altamanu, have worked with the city in recent years to draft plans for pedestrian- and bike-friendly streets from Mayfair to the lakefront. Cabrini Green Kablooey. This Wednesday, the last high rise tower at Chicago's Cabrini Green site will be demolished, marking the end of the famous housing project. Polis reminds us that artist Jan Tichy and social worker Efrat Appel plan to mark the occasion with an art installation. 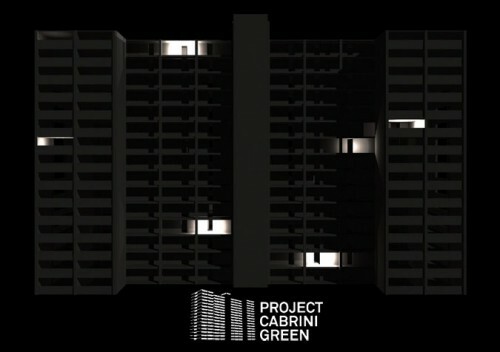 Project Cabrini Green translates 134 poems into light and will begin display at 7:00pm tonight. (Also catch a live internet feed here.) Earth Hour. This past weekend, people, companies, and cities all over the globe celebrated Earth Hour by switching off the lights to spotlight issues of energy consumption. The Boston Globe's Big Picture is running a photo essay of some dramatic skylines with and without lights. Calming Queens. StreetsBlog brings news of New York's latest traffic calming measure proposed for 48th Avenue and 44th Drive in Queens. The block shown above in Long Island City would initially be painted for affordability and eventually transformed into a greenway. Cribs. Inspired by Philip Johnson's Glass House, Curbed goes in search of the homes of famous architects. Represented in the list are Alvar Aalto, Frank Gehry, Norman Foster, and Robert A.M. Stern. [ Quick Clicks> A hand-selected tour of links from around the world. ] Ruination. Mayor Bloomberg received an angry letter in the mail last week from Zahi Hawass, the secretary general of Egypt's Supreme Council of Antiquities. According to the NY Times, Hawass is threatening to take back the circa-1500 B.C. monument if the city doesn't properly care for the inscribed hieroglyphics. 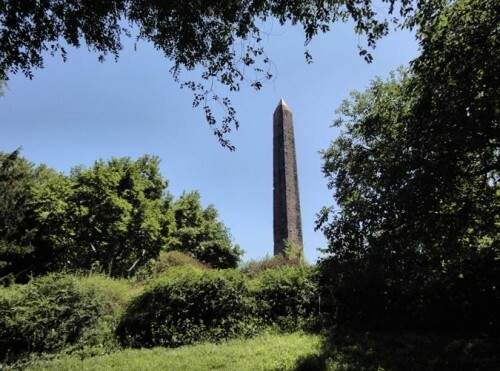 Heavily eroded, the obelisk was a gifted to the United States in 1869 to celebrate the completion of the Suez Canal. Out of Context. After last week's unveiling of the Broad Art Foundation in Los Angeles, NY Times architecture critic Nicolai Ouroussoff penned a rather scathing critique of of the Diller Scofidio + Renfro designed museum. Among his jabs was a note that the design was out of context to LA's landscape of freeways and sprawl causing Charles Siegel (Preservation Institute Blog) to wonder whether it's appropriate to build to the context of autopian sprawl. Planning Issues. Planetizen has compiled a list of 2010's "Top Planning Issues." Last year was great for renting, bikes, and China but not so hot for city finances, McMansions, or free parking. Movement. The Sydney Morning Herald weighs in on Frank Gehry's recently unveiled UTS building in Sydney, and architect Elizabeth Farrelly raises her concerns. "It's not a choice between the dull box and the exuberant PR-driven sculpture. There is a third option: architecture. We deserve it." (Via ArchNewsNow.) Resolutions. Chicago is going on a road diet. The Chicago Tribune says the city will undertake the traffic experiment on a mile-long stretch of Lawrence Street. The four-lane road will be trimmed down to three lanes with widened sidewalks, landscaped islands, and, of course, bike lanes. While Chicago has already slimmed down nearly a dozen other neighborhood streets in recent years, this example is the first time it's being done on a major arterial road. Construction will begin next year if funding comes through.